Those of us who don’t work in high finance tend to think of those who do work in high finance as automatically having it made. A careful look at the cold-callers in movies such as “Boiler Room” and “The Wolf of Wall Street” will give you a different picture, but trying to con people while you’re sitting in an office wearing a suit is still less tedious and wearying than digging a ditch, and there’s always the promise that once you break through somehow that yacht is just around the corner. 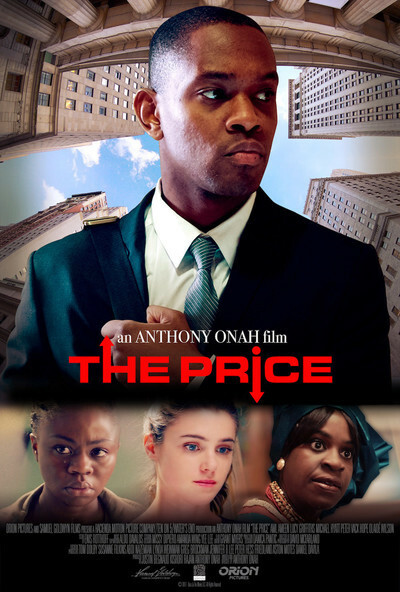 It’s no spoiler to say that for Seyi Ogunde, the young whiz who’s the protagonist of Anthony Onah’s new film “The Price,” the yacht doesn’t even get within hailing distance. Seyi, a Nigerian-American played by Aml Ameen, is likely the only person of color at his trading firm. An opening scene shows a glum routine: brushing teeth, suiting up, getting to work, solving a problem for a white colleague and watching the white colleague go and take credit for the brilliant fix that was actually Seyi’s idea. Soon a white co-worker will saunter over to Seyi’s cubicle with an entreaty that the hard-working analyst get some down time. “You wanna get the girls in the bed sheets, you got to lay off the spreadsheets,” insists this genius bro. But Seyi has little time for play. He’s a main means of support for his family, at whose Hackensack home he spends too little time by their lights, and too much time by his. His dad is suffering from the aftereffects from a stroke; his mom is mostly invested in browbeating Seyi for not contributing enough to his father’s upkeep; his younger sister is just obnoxious in the mode of younger sisters everywhere. Seyi’s stress and frustration, not to mention a growing Adderall habit, start to wear on his character. Hoping for a quick score to launch him out of the cubicle ghetto, he tries to orchestrate a shady insider trade. He begins dating Liz (Lucy Griffiths) a young white woman who spent some time in Cameroon, who has a boyfriend but is nonetheless intrigued by Seyi, who’s charming and brilliant and contrary in ways she clearly finds intriguing; on their first date, he expressed disappointment in Barack Obama in blunt, vehement terms. They come together and pull apart, partially because of Liz’s other relationship but also because of Sayi’s withholding. Although he’s clearly desperate for connection, he’s also embarrassed to be himself, to reveal too much of his background. He wants Liz’s approval and affection without having to show her who he actually is. All these tensions, combined with the everyday tensions of pushing up against institutional racism, which has a nice way of camouflaging itself in Seyi’s professional world, put Seyi in danger of a meltdown. You can see what might be coming when a colleague finds out about Seyi’s Adderall secret. Instead of busting him, he says, “That’s for the kids, man. When you’re ready to graduate from high school, give me a call.” What Seyi discovers is that there’s no such thing as getting your hands a little dirty in this world. And just as he’s about to blow up his future, the wreckage of his own family’s past hits him in the face. The fix this movie gives the character is the oldest one in the book: the truth shall set you free. The value of “The Price” is that it doesn’t shy away from the fact that this particular truth is sometimes the hardest one to face.